Cider wouldn’t do for playgroup (although I’m tucking that idea away for another time!) … and apple juice just had me thinking of mopping up sticky spills on the floor, so instead I decided to fill them with stewed apples and blueberries with a dollop of plain yogurt and a blueberry on the top. Also a sprinkle of chia seeds. Yummy! And the fun bit is being able to eat your cup afterwards. Wouldn’t these be a great idea for a children’s party? Healthy and delicious and fun. 2) Use a knife to mark out an inner circle, leaving a bit of apple between the middle and the skin for the wall. 3) Use a melon-baller to scoop out the apple flesh. If you are not using the apples straight away you can rinse the apples in a bit of lemon juice to stop them from turning brown inside. 4) Save the apple flesh, cut out the pips and bits of core, then stew the apple (with some other fruit too if you like). Stewed apple is easy – place chopped apple in a pot with a teensy bit of water and heat and stir until it is all mushy! I added blueberries to my stew. 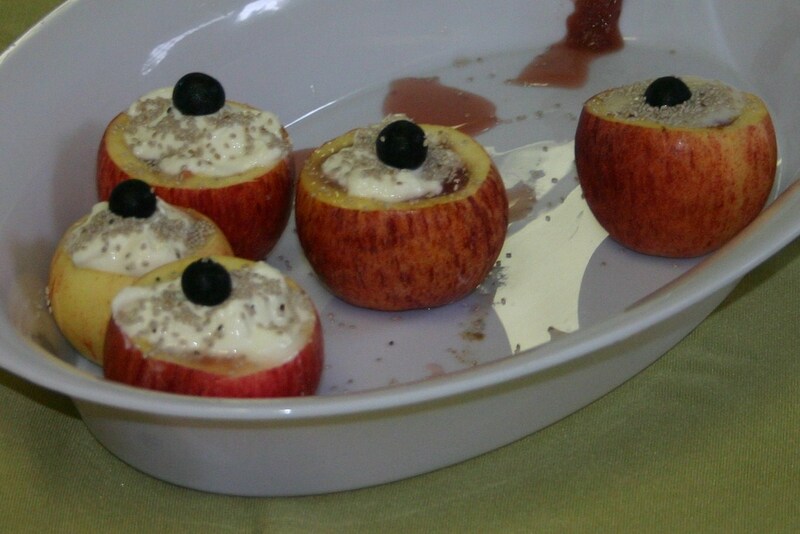 5) Return stewed fruit to the inside of the apples and top with yogurt, chopped fruit, nuts, muesli …whatever you like! You can of course use them to drink from too.